The Ajax Finechem product range extends to more than 4000 product lines including ACS grade reagents, high purity acids and solvents for HPLC, GC, Spectroscopy and Pesticide Residue analysis, volumetric solutions, pH buffer solutions ICP & AAS standards, certified ultra pure acids for trace metal analysis and a range of products for specific applications. Ajax brand chemicals are available in a variety of pack sizes and packaging options including glass or plastic bottles and metal or plastic drums. Ultra pure reagents that exceed ACS specifications are used in highly sensitive analysis. These reagents are ideal for trace metal analysis and as reference standards. UNIVAR® products have long been recognised as the standard for analytical reagents in Australia and in overseas markets. In many cases, the purity conforms to and exceeds ACS. UNIVOL® ready to use analytical volumetric solutions are standardised to specific concentrations normally used in laboratory analysis. UNILAB® products are reagent quality chemicals suitable for general laboratory work, and in most cases, meet BP and/or USP standards. UNICHROM® product range is specially made for high performance liquid chromatography. The range includes high purity solvents, tested to meet strict UV absorbance specifications as well as ion pairing reagents. 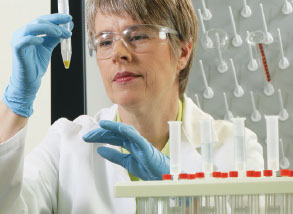 SPECTROSOL® reagents are specifically made to conform to strict quality specifications for UV, Visible and Atomic Absorption Spectroscopy (AAS) techniques.